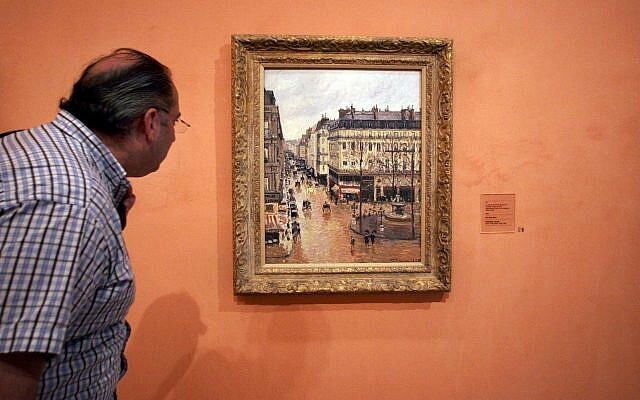 This May 12, 2005, file photo shows an unidentified visitor viewing the Impressionist painting called "Rue St.-Honore, Apres-Midi, Effet de Pluie" painted in 1897 by Camille Pissarro, on display in the Thyssen-Bornemisza Museum in Madrid. LOS ANGELES (AP) — The great-grandson of a Jewish woman who surrendered her priceless Camille Pissarro painting to escape the Holocaust watched Tuesday as his lawyer relentlessly grilled officials of the Spanish museum where it now hangs, expressing incredulity that they didn’t know it was Nazi looted art. Members of the museum’s legal and research team, including some who were there when the painting “Rue St.-Honore, Apres-Midi, Effet de Pluie” was acquired in 1992, insisted due diligence was done. They added they had no idea it was stolen until Lilly Cassirer’s grandson, Claude, discovered it in 1999. For nearly 20 years, the family has been battling to get it back. The museum maintains the work, valued at more than $30 million, was acquired in good faith and it should be allowed to keep it. “I’m delighted we finally had our day in court. I’m cautiously optimistic,” David Cassirer, whose great-grandmother surrendered the painting, said outside court. He has continued the legal fight for the painting since his father died. During more than five hours of testimony Tuesday, attorney David Boies pressed officials representing Madrid’s Thyssen-Bornemisza museum, often expressing doubt they seemed to know so little about the painting’s history when it was purchased in 1992. The painting was one of hundreds that Spain and a nonprofit foundation acquired from Baron Hans-Heinrich Thyssen-Bornemisza to create the museum that now bears the German industrialist’s name. The stunning oil-on-canvass work, whose title translates in English to “Rue Saint-Honoré in the Afternoon, Effect of Rain,” was painted in 1897. 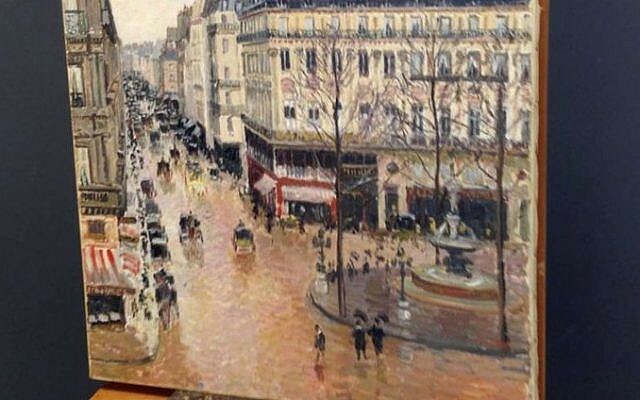 It shows a rainy Paris street scene the artist observed from his hotel window. Lilly Cassirer’s father-in-law bought it directly from Pissarro’s art dealer and left it to her and her husband when he died. She traded it to the Nazis in 1939 in exchange for exit visas for herself, her husband and her grandson. The post-World War II German government, thinking the work was lost, paid her $13,000 in reparations in 1958. In truth it had been sold and resold in Germany before arriving in the United States sometime after 1943. Thyssen-Bornemisza bought it from New York gallery owner Stephan Hahn in 1976. Boies often drew curt replies of “I don’t know” from museum officials when he asked repeatedly if they could explain how the painting arrived in the United States and why, when Thyssen-Bornemisza bought it from a New York dealer, he didn’t seem to know who the seller was. Also why, in one document, the baron indicated the transaction took place in Paris when it really happened in New York. “Sometimes an error is just an error,” one of the museum’s provenance experts, Laurie Stein, said of the Paris-New York discrepancy. Asked if the baron ever looked on the back of the painting to see its provenance labels, including one from Lilly Cassirer’s father’s art gallery in Berlin, she said she didn’t know. Another expert, Lynn Nicholas, said she didn’t know if the museum had traced the painting’s provenance when it acquired it. Under questioning from museum attorney Thaddeus Stauber, she added that the definition of provenance has changed greatly over the years. “It wasn’t until the ’90s that modern provenance came into being,” she said, adding that before that provenance mainly involved determining a work’s authenticity. Tracing stolen or looted works became more commonplace, she said, with the rise of the internet and international agreements between countries. At the conclusion of Tuesday’s testimony US District Judge John F. Walter gave attorneys for both sides until Feb. 10 to submit post-trial motions and arguments. He isn’t expected to rule until sometime next spring.